An unusual little map of the southeastern corner of New York City's Central Park. Depicts from 61st Street south to the intersection of 58th street and 5th Avenue . Shows the planned ornamentation and redirection of traffic to accommodate the park drives. Shows the clock tower, the then proposed monument that now sits in front of the former Plaza Hotel and Bergdorf Goodman. Also depicts the locations of trees, the ponds, and various walkways. 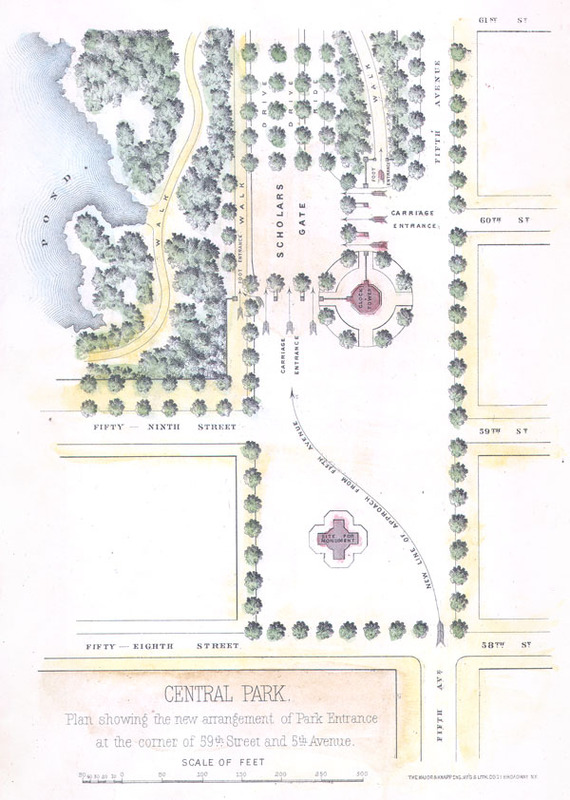 A nice little map of one of the poshest part of Manhattan, Grand Army Plaza. This map was published for inclusion in the 1869 13th Annual Report of the Commissioners of Central Park . On the Central Park: Vaux and Olmstead were awarded the task of designing Central Park in 1853 by the City Common Council. Olmstead's vision drove the overall design while Vaux concentrated his attentions on bridges, buildings, and other structures within the park. The creation of Central Park, which was to consist of some 800 acres of public forest, pathways, promenades, lakes, bridges, and meadows, was a seminal moment in civic urban design. The park itself was designed as a whole with every tree, pond, and bench meticulously planned. Olmstead wrote: 'Every foot of the parks surface, every tree and bush, as well as every arch, roadway, and walk and been placed where it is for a purpose.' Historian Gloria Deak writes, 'There was a staggering amount of work to be done to transform the area into a blend of pastoral and woodland scenery. This involved the design and construction of roadways, tunnels, bridges, arches, stairways, fountains, benches, lamp posts, gates, fences and innumerable other artifacts. It also involved the supervision of an army of about five thousand laborers…Olmsted, to whom most of the credit goes, insisted on seeing the multidimensional project as a single work of art, which he was mandated to create. For this purpose, he ventured to assume to himself the title of ‘artist.'' Today, because of Vaux and Olmstead's efforts, New York Yorkers, ourselves included, have the privlidge of enjoying what is, perhaps, the finest example of a planned urban public recreation area in the world. Very good condition. Minor closed tear at bottom margin of the map not extending into the printed area. Hand color. Blank on verso.